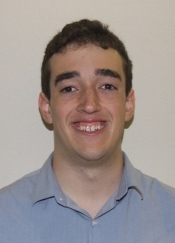 The Office of Undergraduate Research announced that Justin Biel is OSU’s first Undergraduate Researcher of the Year. A senior honors student in biochemistry/biophysics, Biel has done research at OSU with Dr. Andy Karplus and Dr. Elisar Barbar. He participated in the HHMI Summer undergraduate research program and plans a research career in biophysics. He will attend UCSF in pursuit of his Ph.D. beginning this fall. Earlier this year Biel was awarded the title of “Best Undergraduate Talk,” at the West Coast Protein Crystallography Workshop XXI 2013, which was held in Monterey, California on March 17-20, 2013. His talk, “Bent out of Shape: All Prolyl Peptides Deviate from Planarity,” was the only one given by an undergraduate at the meeting. The workshop leaders were so impressed they created the award for him.